Viewers of the TV travel/homes series "Escape to the Country" should check out the editions screened in February 2009, as one special show will extensively feature Portmeirion. 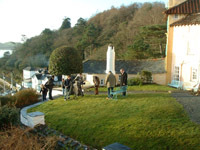 On Wednesday 17th December, a film crew (left) shot around the village, including an interview with Managing Director Robin Llywelyn. Update 1/4/09: This edition will be aired on 17/04/09 at 5:15pm on BBC 2.